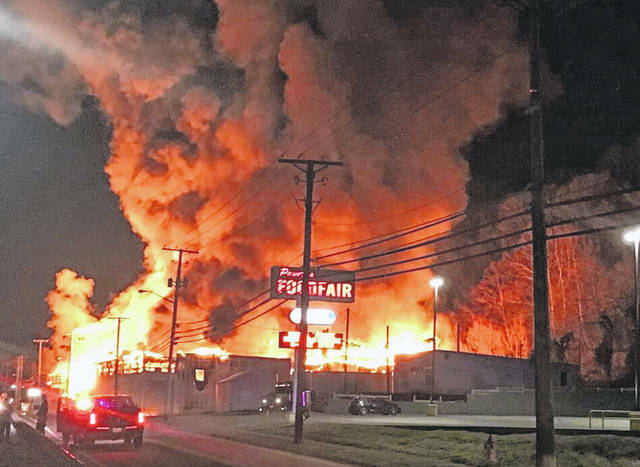 Seventy firefighters from five departments, along with other first responders, were on the scene of a large commercial fire at the former Midwest Steel/Mountaineer Metals building on East Main Street Saturday night and Sunday. POMEROY — Smoke could be seen from miles away as a nearly 100 year old commercial building in Pomeroy caught fire late Saturday night. 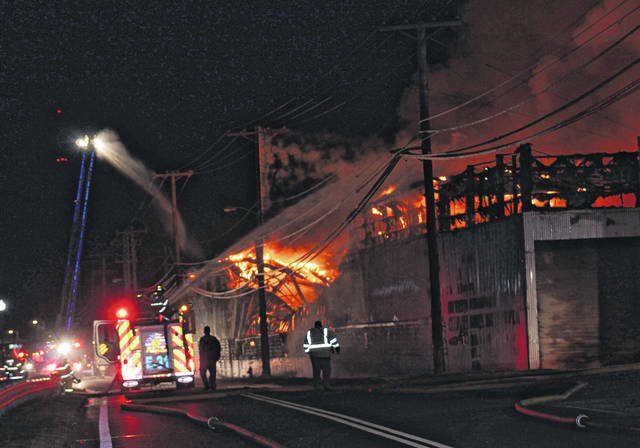 Around 11:15 p.m. on Saturday, firefighters from the Pomeroy, Middleport and Rutland Volunteer Fire Departments were alerted to a working commercial building fire on East Main Street at the former Midwest Steel/Mountaineer Metals building. Arriving on scene, firefighters found heavy smoke and fire showing from the structure. At that time additional manpower and resources were called for, including firefighters from the Syracuse and Mason (W.Va.) volunteer fire departments. 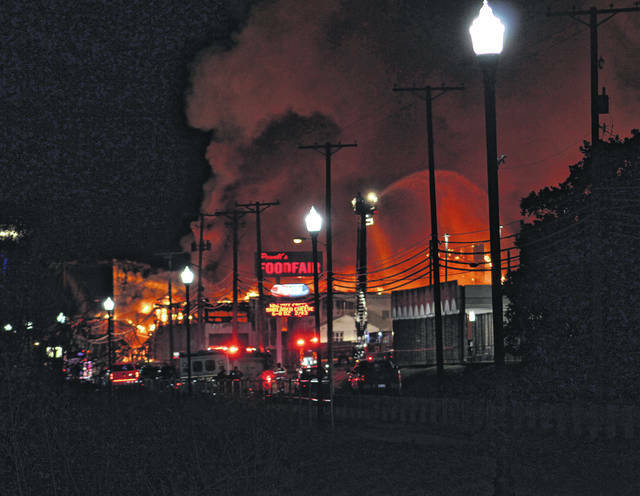 “Due to the size of the fire and heavy involvement, crews set up a defensive position and placed ladder trucks on both ends of the building. Crews from Mason and Syracuse set up water supply via hydrant supply to both ladders to use for extinguishment of heavy flames. Crews from the different departments also used hand lines to hit various fires pockets in and around the back side of the building. After two hours, crews made entry into the structure to hit hot spots, and fire pockets that were under part of the roof that had collapsed into the structure,” read the run report from the Pomeroy Volunteer Fire Department. At approximately 3 a.m., Mason, Syracuse, and Rutland Fire Departments were released from the scene. Middleport and Pomeroy remained on-scene until 4:15 a.m. hitting remaining hot spots, before returning to quarters. Also on the scene Saturday night and early Sunday morning were personnel from AEP, who de-energized the power lines passing the rear of the structure and monitored the three phase lines along East Main Street. Pomeroy Public Works employees were also on-scene to assist throughout the night. Crews from the Pomeroy Fire Department were called back again on Sunday afternoon to the building which was being used by Belt Transfer at the time of the fire. On Sunday afternoon, Ladder 2 arrived to find smoldering pockets of fire that were left over from insulation and building materials throughout the building. Hand lines were deployed off a fire hydrant and from Pumper 3 to extinguish the fires. While on-scene, crews discovered a small fire in a lightly damaged part of the building. Ladder 2 removed parts of the outer building and extinguished the fire. Crews were on-site throughout the afternoon mopping up the fire. 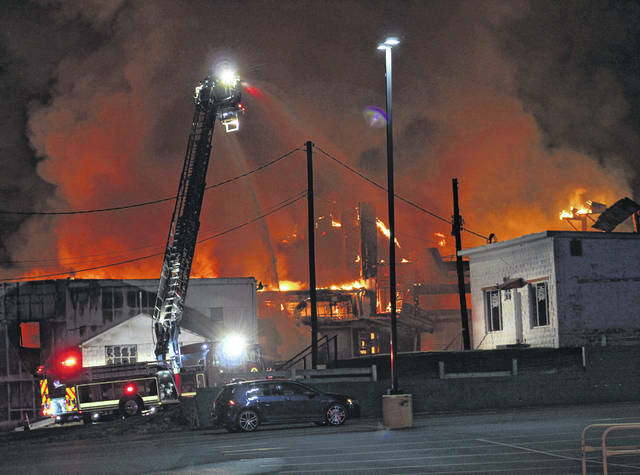 The work of the firefighters kept the blaze contained to the building of origin, keeping it from the nearby office building and the former trolley car building which is between the Midwest Steel Building and the Pomeroy Village Hall. The Ohio State Fire Marshal’s office was on scene Monday and will be handling the investigation into the origin of the fire. The cause of the fire is not yet known as the investigation is just beginning, according to the State Fire Marshal’s Office. 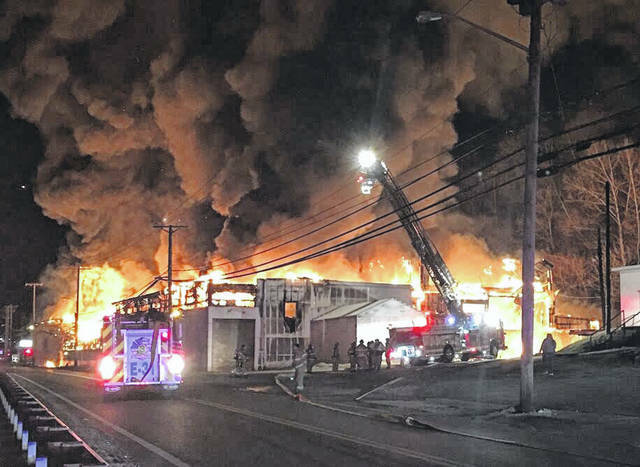 Responding to the fire on Saturday night were Pomeroy Ladder 2, Pumper 1, Pumper 3 and Rescue 4; Middleport Ladder 16, Engine 13, and Rescue 17; Rutland Engine 43 and Rescue 44; Syracuse Engines 31 and 34; Mason Engines 51 and 53; Meigs County EMS and EMA; Pomeroy and Middleport Police Departments; and the Ohio Department of Transportation. On Sunday, responding were Ladder 2, Pumpers 1 and 3, Rescue 4, and the two “new-to-us” Pomeroy pumpers (new Pumper 3, and another yet to be numbered truck that arrived Sunday). Around 70 firefighters from the 5 stations responded to bring the fire under control. According to local historian Jordan Pickens, the building was built in 1921 as the Pomeroy Machine Company and was sold to the Parkersburg Rig and Reel, employing around 500 men and playing a part in the onset of America’s Iron Age. In 1961, the building became a branch of the Midwest Steel Corporation. Most recently, it was Belt Transfer.